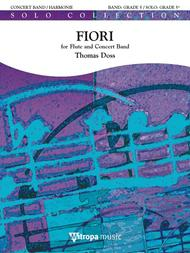 For Flute and Concert Band. Composed by Thomas Doss. Solo Collection. Solo & Concerto. Score Only. Composed 2017. 50 pages. Mitropa Music #2117-17-140 M. Published by Mitropa Music (BT.2117-17-140-M). Fiori finds its genesis in a walk through an impressionistic garden. It expresses not only the atmosphere and mood but also tiny and grotesque scenes between the insects. The flute, as a solo instrument, plays a perfect role in this marvellous micro world. 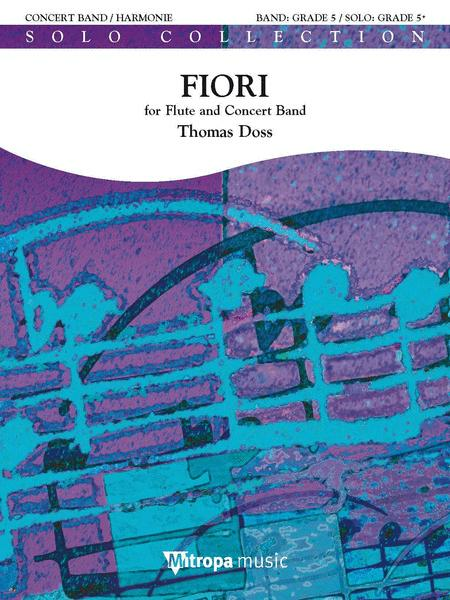 It was a challenge for the composer to integrate the sound of the flute through the "fragrance of flowers and exotic plants that fills the air". Fiori vindt zijn oorsprong in een wandeling door een impressionistische tuin. Het werk weerspiegelt niet alleen de sfeer en stemming, maar ook kleine, groteske taferelen uit de wereld der insecten. De solofluit past perfect in deze prachtige microwereld. De componist beschouwde het als een uitdaging om de klank van de fluit te integreren in de 'geur van bloemen en exotische planten die in de lucht hangt'. Das Stuck Fiori ist von einem Spaziergang in einem impressionistischen Garten inspiriert. Es soll sowohl Farbstimmungen zum Ausdruck bringen als auch kleinere, groteske Szenen im Insektenreich beschreiben. Die Flote als Soloinstrument spielt eine perfekte Rolle in dieser wunderbaren Mikrowelt. Fur den Komponisten stellte es eine grosse Herausforderung dar, den Klang der Flote in den "verstromenden Duft von Blumen und exotischen Pflanzen" zu integrieren. Fiori est inspire d'une promenade dans un jardin impressionniste. L'oeuvre expose non seulement son atmosphere et ambiance mais aussi des petites scenes grotesques du monde des insectes. La flute joue un role parfait comme instrument solo dans ce micro monde. C'etait un defi pour le compositeur d'integrer le son de la flute dans le parfum des fleurs et plantes exotiques qui remplit l'air. Fiori trova la sua genesi in una passeggiata attraverso un giardino impressionista. Esprime non solo l'atmosfera e l'umore, ma anche piccole e grottesche scene tra gli insetti. Il flauto, come strumento solista, gioca un ruolo perfetto in questo meraviglioso micro mondo. E' stata una sfida per il compositore integrare il suono del flauto all'interno di una "fragranza di fiori e piante esotiche che riempie l'aria".